We were delighted to be recently featured in Print Week for our recent rebrand and positioning work with agency GW+Co. 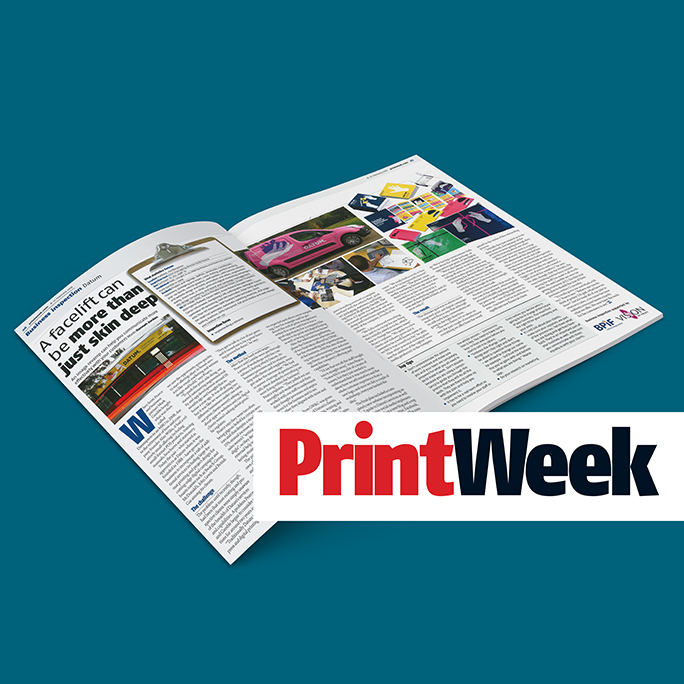 Below we’ve republished the article by Hannah Jordan at Print Week. When Scott Pearce and business partner Mark Gamble bought what was then called Datumpress in an MBO in 2008, due to the retirement of boss and company founder Alan Willis, it had a relatively small offering including small-format POS products, training manuals, brochures and stationery. Today the pair – who started as apprentices at Datum when it was founded in 1988 – have grown the business to incorporate a raft of additional services including large-format printing and project design for cutting-edge digital campaigns and boasts names such as Swatch Group, McDonald’s, John Lewis and British Gas among its clients. The problem until recently, though, had been that most existing and prospective clients were simply unaware of the breadth of Datum’s services and capabilities. A problem Pearce and Gamble began to consider solutions for around two years ago. “Traditionally Datum was a pre-press and digital printing firm, but we saw the opportunity quite quickly to start offering other in-house services like email marketing and website design and build,” says Pearce. “To push the print side along, we started outsourcing augmented reality and app development around 18 months ago and brought that in-house a year ago. It was all going fine but it was like we were running two different businesses under one roof: our print clients weren’t asking us about apps or websites and our digital clients weren’t asking about print,” he explains. Pearce says they were too often being pigeon-holed for certain services and that despite a steady 10%-15% annual increase in turnover, sales weren’t “setting the world alight”, so they decided to enlist external help to shake up their marketing strategy. The pair considered three of its own clients to help deliver the work and decided on marketing consultancy GW+Co, with whom they’d collaborated on campaigns for a variety of clients. The first thing Pearce did was to take GW+Co to Dscoop Budapest in June 2014 to help its designers really get under the skin of the industry. “They got to talk to a lot of our peers and it turned out to be a great learning process for them,” he says. The team from GW+Co was given access to a range of Datum’s clients, large and small, existing, waning and prospective as well as a number of industry peers who all provided opinions on how the business was operating and what they felt it was getting right or indeed, not so right. After the information gathering phase the Datum team selected one of two final ideas offered by GW+Co for the rebranding and repositioning of the business, with the aim of boosting sales and ensuring new and existing clients are given a clear message about the company’s offering and capabilities. The final plan included a completely new website incorporating an A-Z guide to Datum’s services as well as extensive social media implementation including a new blog and a regular presence on Twitter, Facebook, Pinterest and Instagram. The company branding received a complete overhaul with the vehicle fleet, product packaging, stationery and building exterior all getting a facelift. The online A-Z guide was also produced as a small printed handbook and sent, along with brochures giving an overview of the company, to each of its clients. “We fully embraced everything they said to us except for one thing they initially asked us to do, which was to change the company name,” Pearce explains. “We spoke to a few clients and industry peers and it seemed to be a well-known name so we felt it was a touch too far,” he adds. The ultimate goal was to attract more integrated print and digital campaign work and Pearce says that although it’s still early days, conversations are going in the right direction. “The new clients we’ve taken on over the past couple of months know everything we offer from the word go. We’re having conversations with them about the whole package, as opposed to just print or just digital. “We’ve also been invited back to see a client, whose work has been tailing off with us, to discuss an augmented reality project with them. So it’s having the desired effect,” he adds. Feedback from clients has been extremely positive too, says Pearce, and the company has even received calls from a couple of rivals to compliment Datum’s new look. Another win has been that much of the cost of the rebrand has been met by work from a significant new financial client gained in the midst of the rebranding process. “Initially they just wanted us to do their artwork, but because of the process we were going through they quickly learned about our other offers and then invested in a large amount of work,” Pearce explains. He admits that the rebrand has taken a lot more work and staff involvement than they had expected. “We were naive to think we were fixing the marketing issue with one stroke when actually we opened a bigger can of worms and created a load of work for ourselves,” he says. He adds, though, that the results, the team-building and the buzz created among the staff has made it all worthwhile. He and Gamble are now targeting a turnover of £1.5m this year and plan to double the size of their premises within 12 months.